Carter is from Grand Prairie and goes to school in grade 11. This is his second year of racing. He became interested in racing when he got involved with the Stott mini wagons. In the off season he plays AA Midget hockey. . He has been around racing all his life and is a 3rd generation driver.He spent the summer of 2012 traveling with his dad, Rod and brother Glen, helping out. In the off season he drives a vac truck.He started out in carts, with help from his dad. He now is starting his second season in the wagon with help from his wife and son. 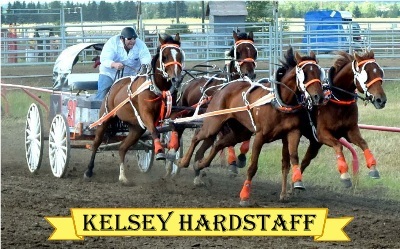 Farms in Kelsey AB., runs three carts and has won first in Buck Lake in 2008. Took second in 2009 and third in 2010 overall points.In 2011 he dropped to 11th then in 2012 and 2013 was back up to 4th.2014 saw him in 2nd place overall again. Leach's usually drive his teams. He was influenced by Garth and Marty Maxwell. Chester is more involved by serving as an Associate Director for the APCCA. 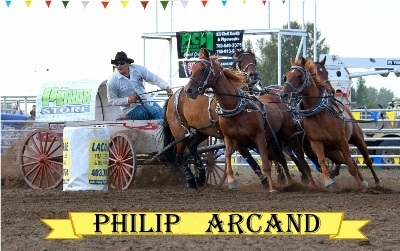 Phillip started racing carts in 2006 and jumped into the wagon box in 2010. He won rookie wagon of that year. He has won a few shows and taken various day money's along the way. He likes traveling with his family all summer and running against his father when the opportunity arises. Robin started racing in 1978 at age 16. He moved to wagons in 1979, He raced both carts and wagons until 1993 then left the racing scene to raise a family and start a career. In 2016 he came out of retirement to race wagons with his son Philip. He's been bitten by the ``horse bug`` again. He is looking forward to a great racing season.. Started carts: 2013 Wagons: 2014. After following son Allan, who started in 2010, Garnet decided to race his own cart in 2013. He ended up Rookie Chariot Driver in the APCCA and officially got the bug! He decided to move to the wagon and won the 2014 Rookie Wagon Driver at the end of the season and was 11th overall in the APCCA standings. 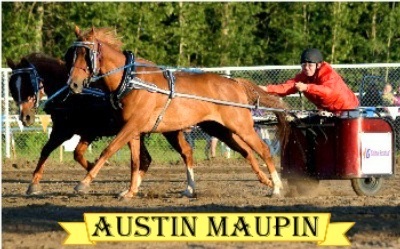 In 2016 he was 4th in the APCCA and his horse Festus was named left wheel horse of the year and presented the Leo Cartier Memorial award. 2017 started out with Garnet winning his first show-being the Alder Flats Rodeo and from there went on to have a good season ending up 10th overall. We are thankful for good horses, good friends, and great sponsors. We look forward to the 2018 season! 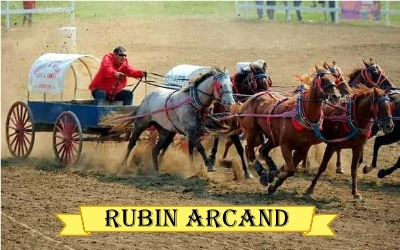 In that year he won rookie in both chariot and wagon in the APCCA. He has continued his success with 2014 finding him 4th place in the carts.In 2016 he ended up the season in 3rd place in the wagons. 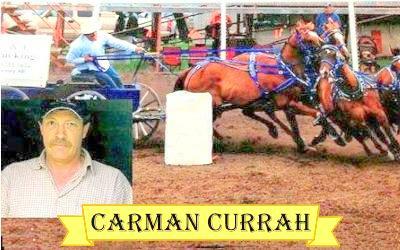 He has also received the Greg Smith Memorial Award, Most Sportsmanlike Driver Award and Cartier's Neckyoke Bunch award for left wheel and left cart horses of the year. During this time his family has expanded with his beautiful wife Samantha and two precious daughters Kendyl and Jayd. Allan continues to thank his sponsors and looks forward to this coming race season. 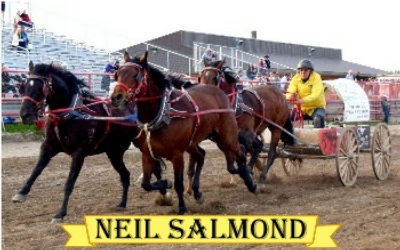 He has raced with the Northern club and Peace River Association. He is a retired Recreation Facility Manager for High Prairie. He and his wife Heather travel all over Alberta and Saskatchewan all summer to get to as many shows as he can. He lives twenty kms west of hwy#1. 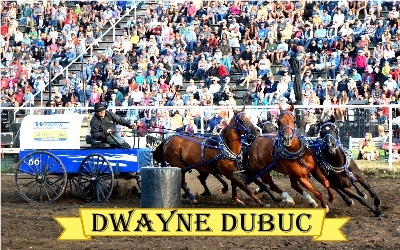 He started traveling with his uncle in the seventies, helping him and later running his cart at shows in Sask. 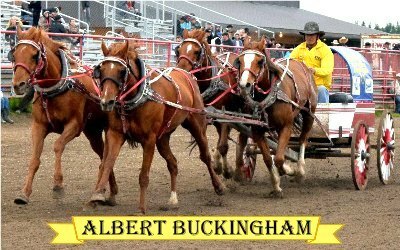 In 1988 he started building chariots on a bet and lucked out and is still making the Buckingham cart. In 1991 they rolled the wagon at his uncles place while exercising, which ended his racing and he sold everything. Albert owned one horse and a cart so he bought one more horse and a trailer and went racing. In 1992 he ran two carts. 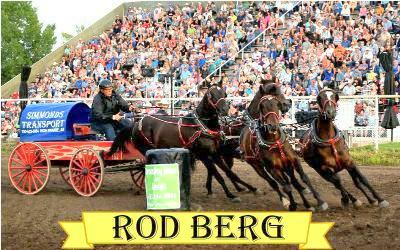 In 1993 he started with a wagon, racing in Sask.In 2006 he came out to Alberta and put in a few shows and every year got more shows in. Now he stays out for the whole summer.In 2012 he was voted for the APCCA Most Sportsmanlike Driver.He is very proud to have been picked for this award. Oscar started racing in 2000 when he started following his father-in-law Ron Morrison. 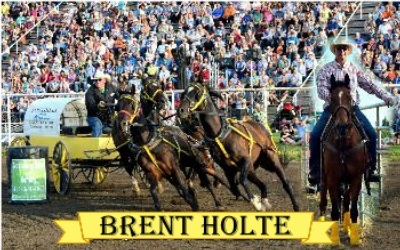 He raises ,trains and sells horses to other drivers all across Alberta and Saskatchewan. started carts 2000 wagons 2002 Mike was around the race track for several years with his dad Gary before he started driving. At age 20 he started in the cart then a couple years later got into the wagon box. Mike has served as a Director few a few years now. Len never owned a horse until after a couple of years of sponsoring the sport, he then decided to try racing for himself. 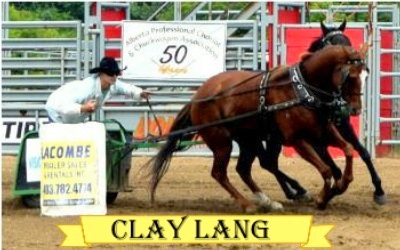 Len was the 2010 All Pro Chariot rookie as well as the Whitecourt champion. 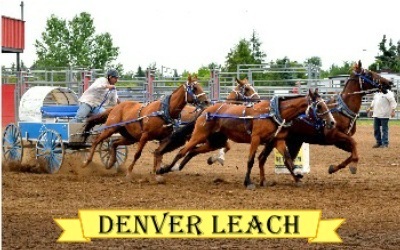 Len was the 2011 chariot champion of Rio Grande, Kikino and Heartlake. Now with the addition of a few more horses and a wagon this brings new challenges. He retired a couple years ago but can't seem to get the sport out of his blood. Kevin started racing in 1988 and moved to wagon in 1997. 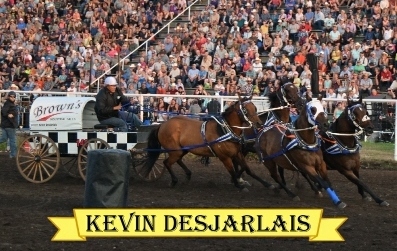 He is a second generation driver following his father Henry Desjarlais. Kevin has won numerous championships and is always a top contender. He has been around the race track most of his life. His grandfather Denis and his dad, Dave, both have been racing for years. His brother Brandon has also taken up the sport and drives also. Brandon has been racing since 2011 winning Rookie Chariot Driver of the year and placed 7th overall in Alberta that year. He has since placed 3rd overall in the cart. 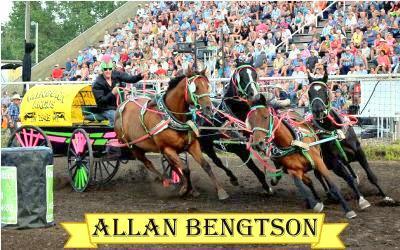 In 2014 he was a rookie driver in the wagon.He enjoys racing in the summer and plays hockey in winter. served as President and as a Director in the APCCA for many years. outfit continues to run in the top ten as he travels up and down the road. a smile on his face because he loves to have fun. Bill started driving cart when he was 18 and wagons the following year. He raced off and on for a while but his love for racing brought him back in 2004 when he started driving other peoples outfits with the APCCA.. 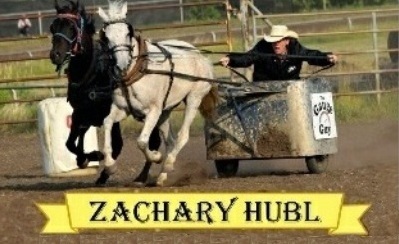 In 2008 he started driving his own cart and 2012 his own wagon. Bill placed 3rd overall with his cart in 2008. He tries to get back to the EPCCA once a year where he started his racing career over 30 yrs, ago. Racing is a big part of Bill's life and he enjoys taking his family down the road with him. Hopefully one day they follow in his footsteps, He has met a lot of great people along the way. Bill was more involved taking on the job of show director for a three year term, which he handled well. In his first season of racing he won the Border Club rookie carts. He is a parts person by trade and enjoys training horses in his spare time. He is an accomplished holder for his dad and his brother Kelsey. 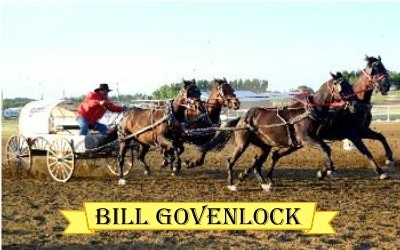 joined the APCCA in 1983, placing first in Alberta in wagons. everyone. Everyone is welcome to stop by and say hello. Started racing in 2016. Martina races with her family Marvin, Linda and Zach. 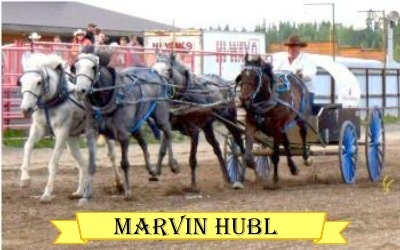 Marvin was born and raised in the Eckville area and began racing after meeting Linda in 1983. 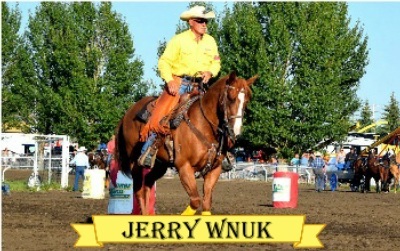 He drove a chariot for about five years just to learn how to drive, and then jumped into the wagon in 1989 and has been there ever since.There have been many highlights including buckles, trophy's, prints,coats, and a trophy-skinning knife. Don't miss the next race because times a wasting. Started racing in 2017. Zach races with his family Marvin, Linda and Martina. 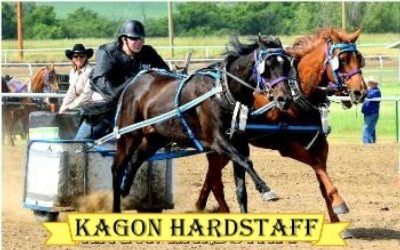 Kim races with the Bengtson Racing Team. 2017 marked her 4th year running her chariot in the APCCA. 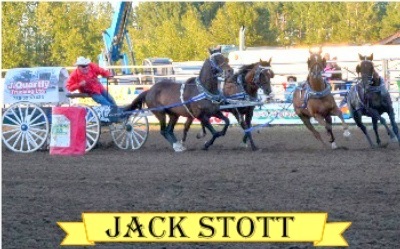 Her horse Jack was named left cart horse of the year and presented the Leo Cartier Memorial Award for 2017. Andileh (perhaps the horse with the most recognizable name on the track) was also in the running for right cart horse. As a team they placed 9th overall for the 2017 season with highlights being 2 day money runs at Buck Lake Stampede and the Ben Rookes Memorial Safe Award. Kim and her team are looking forward to 2018 and are thankful to the fair boards and sponsors that make it possible. Larry is also a rodeo bull fighter, does endurance racing and starting roping this year. In his spare time he manages a Farrier store. Larry started racing by watching Wade Martynek race and decided to try for himself. He has served as an associate directory for 2015 and 2016 seasons. 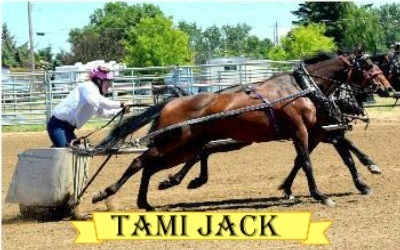 Tami has been racing in Saskatchewan for several years. She started racing in Alberta in 2001 and continues to race in both provinces. In the off season she likes to train and ride horses. American Championship in Red Deer in 1980 and 1990 and the Northern World Finals in 2005.
granddaughters, Wanda Hansen and Rhonda Fuller. Started racing in 1980. Darryl has many top 10 finishes in his long career. His wife, Connie, is his biggest supporter, daughter Tammy married to Brent Lang, also a driver, son Jason married to Joanne, also a driver. His five grandsons are mini wagon drivers. 3 grand daughters also involved in racing. 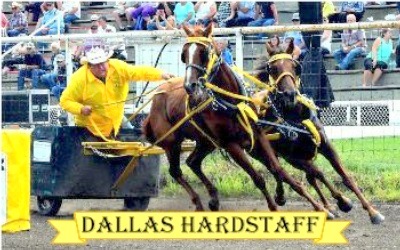 In the off season he spends time in Texas chuckwagon racing. Clay is following in his fathers footsteps. He enjoys playing hockey and does very well. .
Jim(also known as Beaker) lives on a mixed cattle farm with his wife, Wendy. He has three children, Dione, Ryelee and Clay. His son Clay is following in his footsteps and races a chariot. Jim enjoys the racing family and friendly competition that goes along with the summer. .
High Point Champion in the Provincial Club in 2002, 2003 and 2004.
with his sons Cody and Denver. He is a 3rd generation driver who was raised around horses. 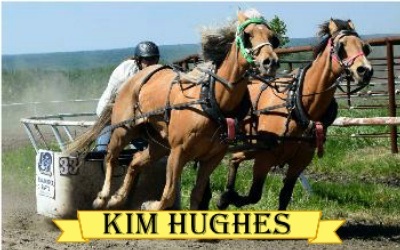 He is a 3rd generation driver who has been around horses all his life. He started in the carts and in 2010 won New Brook. 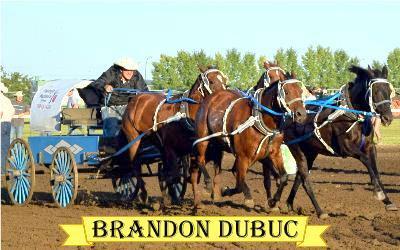 In 2011he won Buffalo Lake and Bruderheim. In 2011 he also won the APCCA Chariot Championship. He also started wagons in 2011.In 2014 he took the year off for shoulder surgery and is back in 2015 for more wins. 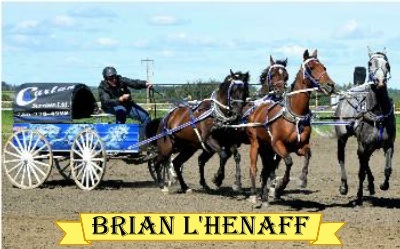 Brian is a 3rd generation driver originally from Salmon Arm B.C. He moved to Alberta in 2006 and started racing. In 2009, winning the AllPro rookie wagon award. In 2016 the team won the Rio Grande Rodeo Aggregate and dash for cash. His wife Juli and two boys, Brady and Carter, travel to as many shows as they can in the summer to make sure Brian has at least 3 people cheering him on. Brian has been sponsored by Carlan Services from Whitecourt for 6 years and can't thank them enough for their continued support. His goals for each year are to ``keep the lows high and the highs in perspective`` and avoid any and all confrontations with the barrels. In 2011 Todd started out sponsoring outfits at races in Rocky Mtn. House. He got to know the drivers and each year got more involved with the sport. In 2015 he hooked his first chariot and started racing. 2016 Todd shared the Family of the Year Award with his wife Therese, son Cody and daughter Austin along with the Bell Family. 2017 Todd started driving wagon and won Rookie of the Year! 2018 Todd won the much deserved Most Sportsmanship Driver! Along with driving a wagon Todd also keeps busy performing the duties of a show director for Alder Flats, Rocky Mountain House, Buck Lake, Millarville. Joining him at the races is his lovely wife Therese who judges and helps out in the infield. Todd is very thankful for past, present and future sponsors and looking forward to many more years of summer get together's and racing. Marty is a second generation driver who followed in his dad,Garth's footsteps. Garth was one of the original founding members in 1968. Marty has been around the races all his 50 some years of life. He has served as a director, President, measuring crew and other committees. He has raced on every track the association has and most likely has won on it or maybe even won multiple times. 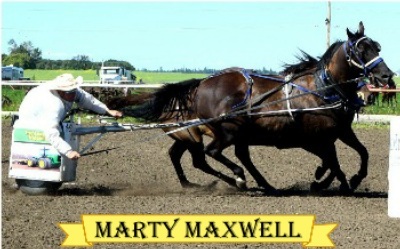 Marty started driving chariots at a fun run in 1983 at age 15 and started wagons in 2002, winning rookie of the year. His biggest passion is the chariot and has been very successful at it, winning 1st and 3rd overall in the APCCA in 2017. 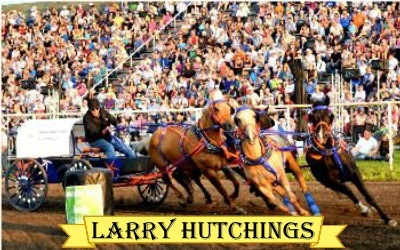 Marty attributes most of his success and many show titles to his hard turning chariot teams. He has always been a very hard working and dedicated member of the APCCA. Miles is a single father with son Gibson and is a 2nd generation driver. 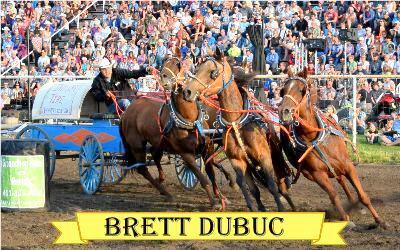 He was a three time Manitoba High Point Chariot Champion and in 2005 he was Manitoba Stampede Chuckwagon Champion. For many years he has served on the Manitoba Association Board of Directors. He has served as Vice President of the club and now is the President. 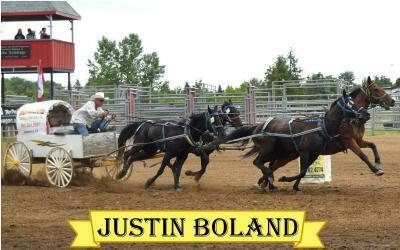 He has competed all over western Canada and was selected to drive a wagon at Rodeo Houston in Houston Texas. He is a trucker for Grace Cattle Carriers. His son Tyrel and daughter Dezerea both race. His wife Bonny often helps with timing. He is a third generation driver who usually is in the top ten. He took top rookie honors in the Clover Park Club for carts in 2004. He won rookie wagon driver in the APCCA in 2007. He also has served as Associate Director in the APCCA. A second generation driver who started out the same time as his father Harry. He has been first in his club on occasion and is a top finisher most of the time. He has been racing carts and wagons for over 30 years. 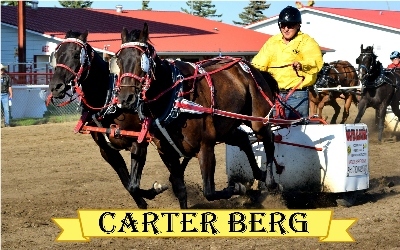 Started racing chariot in 1999 and Wagon in 2007. Rob grew up in Watson Sask. 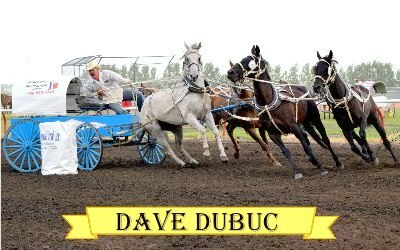 and has been around chuckwagon racing all of his life. He started chariots at age 16. He moved to Lloydminster in 2003 to pursue a career as a heavy duty mechanic. 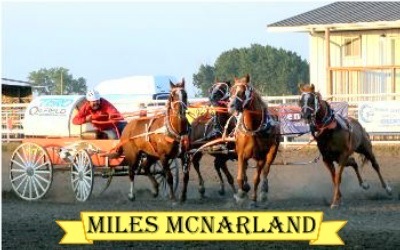 When the time was right in 2007 he decided to start his own chuckwagon outfit, racing all over Alberta and Sask. 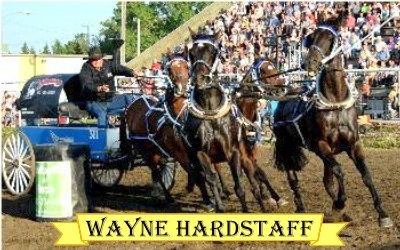 In his first year he won Rookie Wagon Driver of the year and has been improving his team every year since. In 2012 his horse Roy won left pole horse of the year and in 2014 his horse Edgar was also named left pole horse of the year. In 2017 he had three show championships and placed top three in the majority of shows that year. He moved to Ardrossan AB. in 2012 to be with his wife Kaila who he married in 2014. In 2016 they had their son Bentley and in 2018 their daughter Brinley. 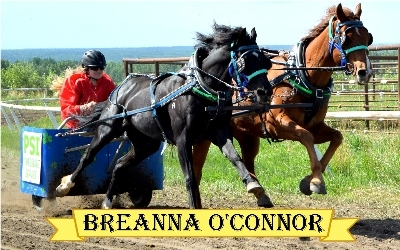 Breanna is a 3rd generation driver following her papa Dan O'Connor and Dad Jim O'Connor. She is no stranger to racing as she has grown up on the track her whole life. 2018 she won Rookie of the Year and placed 13 overall!! In the off season Breanna works incredibly hard in school and achieves honors every year! Her other love is basketball. When she's not racing she spends every free minute on the basketball court. She looks forward to many summers of racing and is very thankful for all current and future sponsors that make racing possible! Cassie started racing in 2005 at the age of 15, as a second generation driver following in the footsteps of her dad and brother. That year she won the Central Club Rookie Championship. In 2011 she won the first of three back to back Patricia Rodeo Championship and fourth place overall in the APCCA. 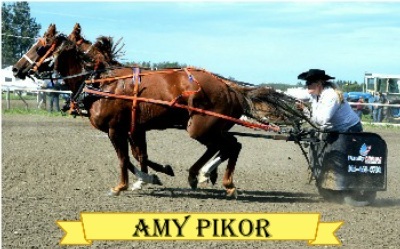 In 2012 and 2013 Cassie won the APCCA Chariot Championship. Cassie is the current Secretary/ Treasurer for the APCCA. Jim is a second generation driver, following in the footsteps of his father Dan O'Connor. He started racing a cart in 1990 and wagon in 1992. 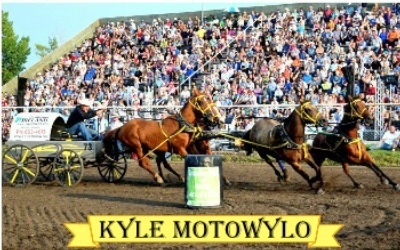 He has won rookie champion in carts and wagons and won several shows such as Ponoka, Rocky Mtn. House and Buck Lake. 2017 Jim won the ``Greg Smith Memorial Buckle`` for Sportsmanship at Vermilion. He has been consistently placing in the top 10 for aggregate standings and placed in the top 4 in 2017. 2018 Jim won the Most Dedicated Driver. Jim is currently a Director for the up coming year and is also always willing to drive for others when needed. His biggest fans are his daughters Breanna and Kallie. Jim very thankful for all current and future sponsors that make racing possible! I started getting involved when our family toured the circuit watching the Smith family in 1998. Dad and I were hooked. We gained knowledge of the sport from some of the legends like Bob Sproule, Don Smith, Jim Becker and Greg Smith. None of which you'd find in a book. I did the circuit with Dad until I met the Cooke family in about 2005. I drove teams for Gary Cooke as well as my dad. Gary was born into a wagon racing family. From the time he could walk, he was racing with friends around pop can barrels with baler twine lines. 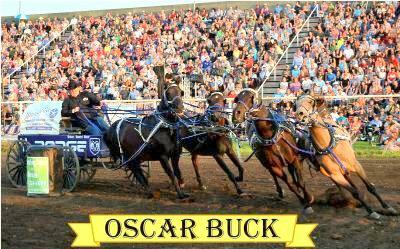 At the age of thirteen, he climbed into a chariot and has been racing horses ever since. 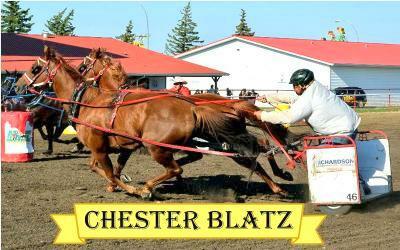 In 1992 he was the Manitoba Chariot Champion. 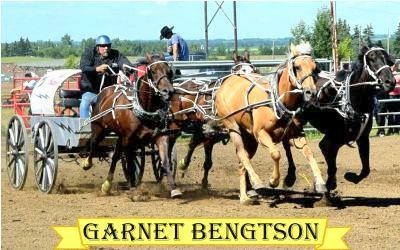 In the summer of 1994, he and his family moved to Alberta where Gary was the rookie wagon driver. He had the fastest track time in Grande Prairie in 2004 penalty free years in 2004 and 2007. 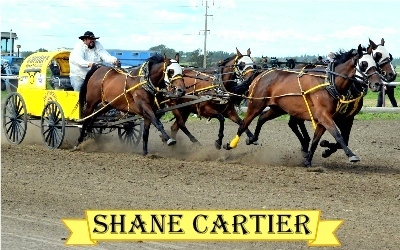 In 2008 he was Williams Lake Chuckwagon Champion, North Thompson Stampede Chariot Champ and Dash for Cash winner in Williams Lake and Red Deer. 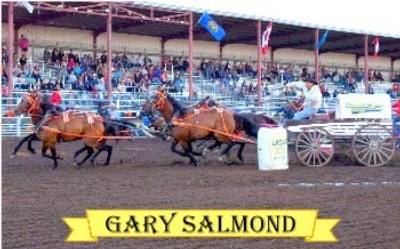 Gary has raced all across Canada and the States. 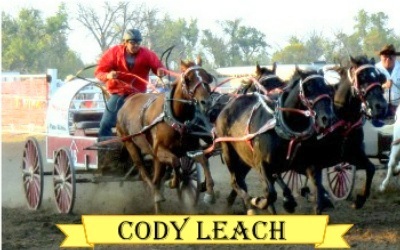 He is looking forward to another good year of wagon racing with his family and friends. 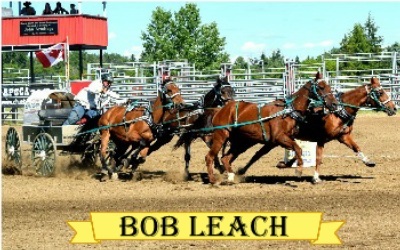 He has been racing carts and wagons across the prairie provinces for over 40 years. He has also been racing in the USA. Neil and Barb's three kids Wade, Evan and Heidi are all drivers in the sport. They all are top contenders. 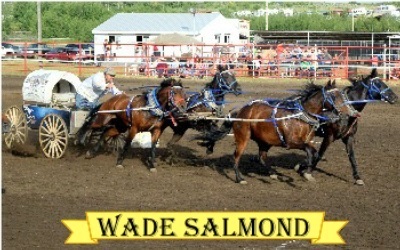 Wade and his father Neil have been racing in all the prairie provinces including the USA. for a number of years. They raise their own thoroughbreds which are in great demand. Wade has won numerous championships and is always a top contender. In 2013 he started following pony racing. Having owned other horses all his life he thought that this would be a fun sport to get involved in. He purchased two horses in 2015 and were part of Marty Maxwell's teams in the 2016 and 2017 race seasons. 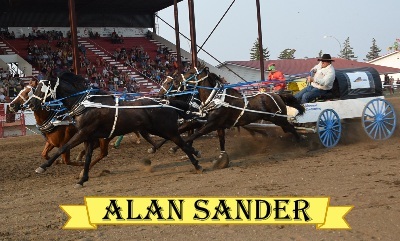 In 2018 the horses were under Alan's name. 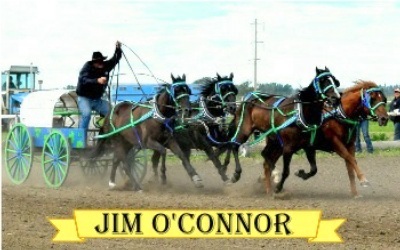 They were driven by Jim O'Connor as he suffered broken ribs. It is his intention to drive this year to enjoy the adrenaline rush. There is nothing like being around the horses and great people in the sport. 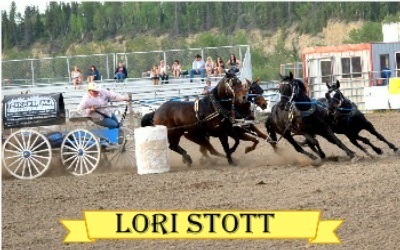 Linda has enjoyed chariot and chuckwagon racing for many years. She followed William and Jean Shippelt into the family sport with chariot racing and fast barrel turns. Marvin came on the scene to be hooked on racing, married Linda and was instrumental in getting them both into the ``wagon seat``. Now their two children are continuing in the family tradition, feeding working horses and racing their own miniatures in the Junior Driving Program. 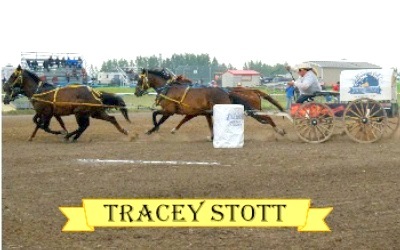 Always competitive,Linda finished well both in 2011 and 2012 and is looking forward to another year of chuckwagon racing. Nick named ``Lou`` she has been around horses and chuckwagons all her life. 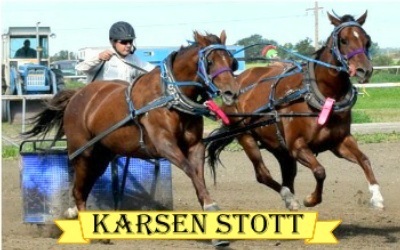 She grew up a barn brat with her other siblings.She joined the Stott Racing Team racing chariots the graduated to the wagons. The team includes her dad Jack, her sister Tracey, her brother John, and brother in law Jonathon Big Charles. 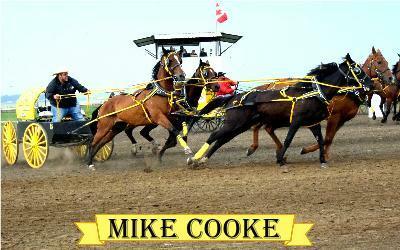 He started racing in the Clover Park Club out of Ft. Saskatchewan. He moved to the Olds area in 1979 and joined the Eckville Club. 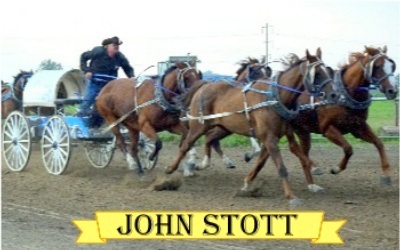 He is proud of the Stott Racing Family which consists of himself, two daughters, one son, and one son-in-law. His grandchildren are also well on their way to following tradition. He has many wins over his lengthy career and quite often is in the top ten. Along with his kids, he enjoys raising, breaking and training horses. She is part of a long line of racers in her family. Her dad Jack, sisters Lori and Karen, brother John and brother in law Jonathon Big Charles have all picked up the lines. Racing is truly in her blood. 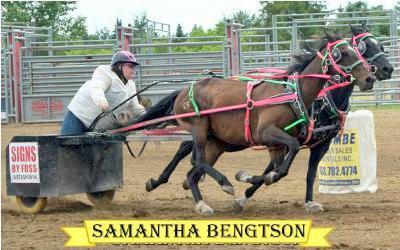 She enjoys breaking horses with her family and watching them succeed on the track with a few wins over the years. Her most memorable win is her Grandpa's Memorial Trophy in Olds. She is currently the secretary for the AllPros and enjoys hockey. Amanda has been racing since 2008. She started out with a real reliable team the first year learning the ropes and has since acquired some new horses. After taking a couple years off due to pregnancy she has returned to racing in 2014 to race along side her husband Chance Thomson. 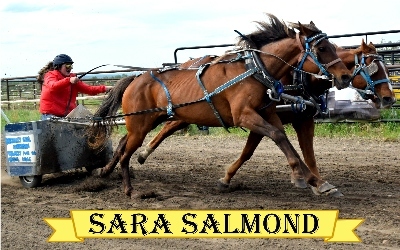 She has a couple of accomplishments including the Sundre Bulls and Wagons Top Chariot in 2011 and also a few best dressed awards for her eye catching colors. Amanda and Chance have a daughter Khloe, and son's Layne and Colby. 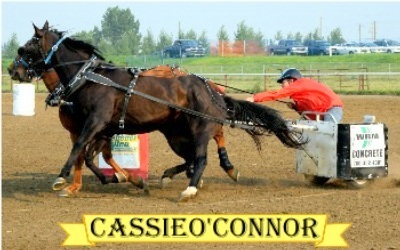 Accomplishments: 2004 Peace River Pony Racing Assoc. Most Sportsmanlike Driver. 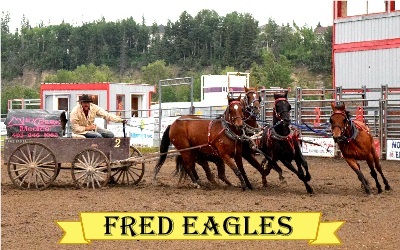 In 2005 in APCCA Rookie Chuckwagon Champion, Highway 43 Rookie Chuckwagon Champion, New Brook Best Dressed Outfit. 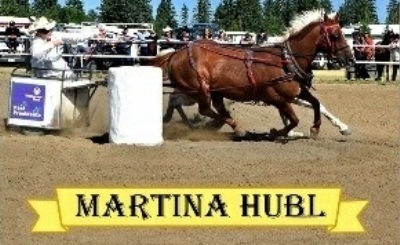 In 2011 Buck Lake Stampede Chariot Champion, Sundre Chariot Champion. 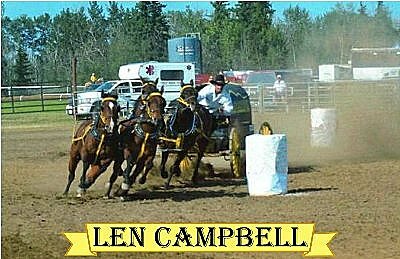 In 2013 Buck Lake Stampede Chuckwagon Champion, Sundre Chuckwagon Champion, Bruderheim Chuckwagon Champion, Red Deer consolation dash winner and the Drumheller Wagon Champion. About Chance:2014 will be Chance's 12th consecutive year as a member of the APCCA, he has also raced with the ALLPRO's, the North West, Prince Albert and Peace clubs. He also served 2 years as a director in the Peace Club. 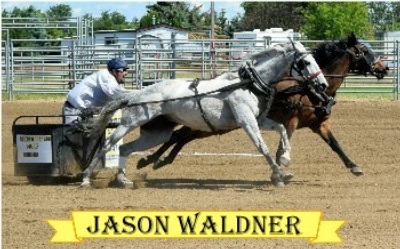 Competing in shows from Chilliwack BC. to Unity Sask. and as far north as Fort Nelson BC. 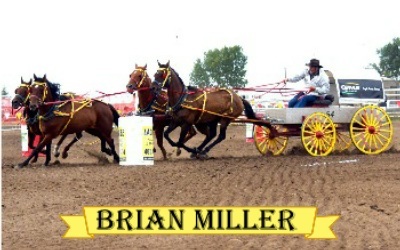 Chance got his start in wagon racing working for fellow competitor Bruce Miners. Chance is the great grandson-law to former driver Bruce Miners.Chance and Amanda have a daughter Kloe and son Layne and make their home at Buck Creek AB. 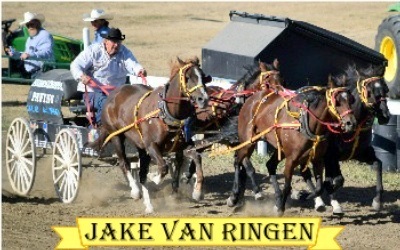 started carts -1973 wagons-1976 Jake came to Canada when he was eight. He is a farmer and enjoys racing. 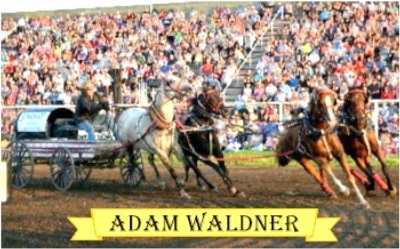 Adam started out as an outrider in 2011. The next year he got into a chariot and hasn't looked back. He was rookie cart champion and placed 3rd overall in 2012. In 2013 he finished 2nd overall and finally in 2014 he succeeded to win overall champion cart in the APCCA. In 2015 he drove the champion chariot for the second year in a row in the APCCA. In 2016 he drove the Mark Harris Memorial wagon and achieved Rookie of the year and second overall. 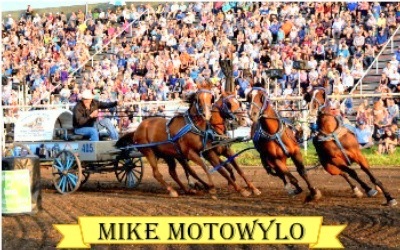 In 2017 he finished 3rd overall in wagons and serves on several committees. Adam has taken up farrier work on the side and has attended farrier school in the USA. Jason followed Adam around the race circuit and soon was driving his own outfit. He also gives Adam a hand with farrier work when needed. Jason won the APCCA Rookie Chariot buckle and would like to thank his friends, family and sponsors for making it possible. Employed by Continental Cattle Carriers Ltd.- book keeper. 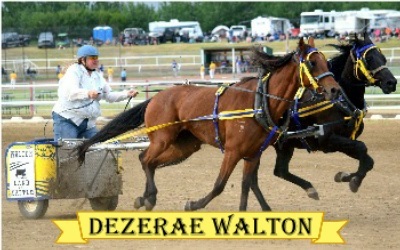 Dezerae has been around the track all her life. Her dad Brian Miller started racing in Saskatchewan in 1985 and then moved to Alberta in the fall of 1989. 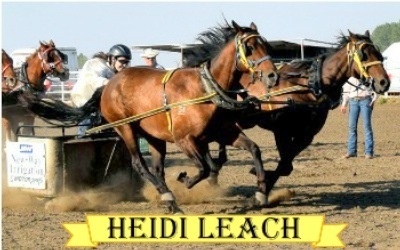 In 2002 she started racing a chariot and has been in three Dash for Cash races in Olds over the years. Now she usually drives two teams, one of which is for breaking young horses. She enjoys watching her horses progress in their racing careers. She got her now husband Tyler behind the chariot lines in 2015 and hopes to one day see their son Rhett race as well. Employed by Westmoreland Coal Company-Sheerness Mine Heavy Duty and Auto Mechanic. Tyler has been racing since 2015 and was Rookie of the Year in the All-Pro Club. 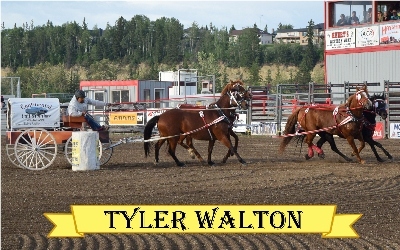 In 2018 Tyler is jumping into the wagon box and hopes to become Rookie of the Year again. 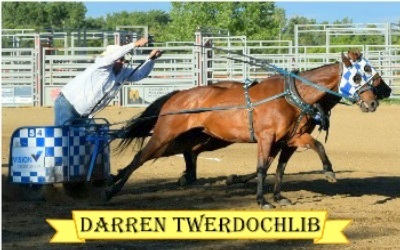 When he is not working at the Sheerness Mine or racing, he operates a 300 head ranch with his parents and his wife Dezerae. Jerry started driving carts then switched to outriding. He has one of the best horses around for outriding called Dino. He was influenced by his dad Joe and Chester Blatz. You can always spot Jerry by his very colorful shirts and leg wraps. This season will be Casey's rookie year in a wagon. Racing runs in the family as he trains and travels with his dad and sister Emily. 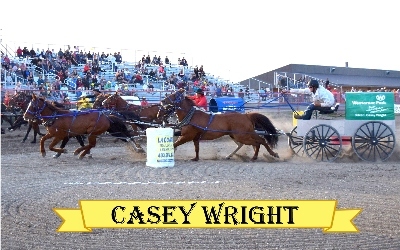 After racing a chariot for the past 3 years Casey has decided to follow his dad Todd and great grandfather Artie's footsteps and race a wagon. Casey is a great advocate for the sport-he is an associate director and you will find him and his sister promoting the sport at schools and other events. 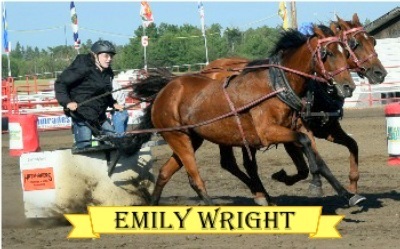 Racing being in the family and after years of barrel racing Emily decided to follow her dad and brother's foot steps and started racing a chariot. Emily is a great advocate for the sport as you will often see her sharing her passion and helping promote the sport at schools and other events. Emily has been awarded a scholarship from the APCCA and been awarded a buckle for Dedicated driver of the year. Racing has been in his blood after following his grandfather, Artie Wright around the tracks in Saskatchewan as a kid. 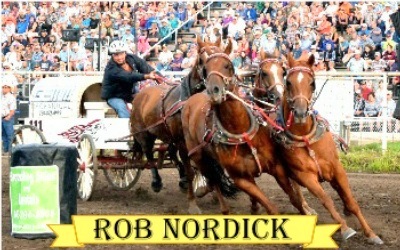 Todd began racing a chariot in 1996 winning rookie of the year in the Calgary pony chuckwagon and chariot association and APCCA. 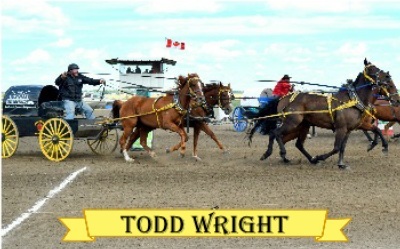 Todd jumped in the wagon box in 1997 winning rookie of the year in the Calgary association. 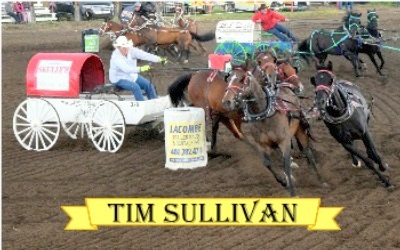 In 1998Todd raced in Saskatchewan following in his grandpa's footsteps then returned to Alberta.Todd hung up the harness in 2002 and again got the itch to race in 2013. He started to purchase a wagon team once again and joined the 2014 APCCA racing circuit. 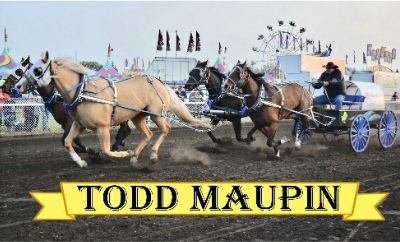 In 2017 Todd finished in the lucky 13 spot overall. Todd is a very good advocate of the sport, showing up at promotional events and entertaining the crowd. In 2018 he is a show director and his son Casey is an associate director. 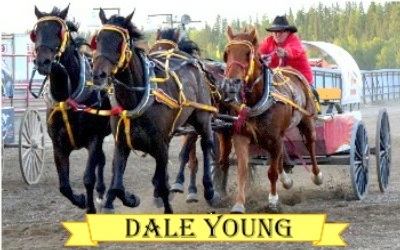 Dale grew up with the sport of Chuckwagon and Chariot racing, so it only seemed natural that he would step into a wagon box. 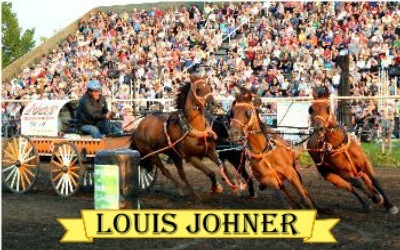 He has raced many places throughout Manitoba, Saskatchewan and Alberta. He is excited again to partner up with the Calgary Flames Ambassadors to promote their favorite hockey team. Dale enjoys traveling with his family down the road from show to show. The invitation is always open to stop by the Flames wagon and get your picture taken.